La Costa Resort and Spa in Carlsbad recently completed a $50 million renovation that included an extensive makeover of both 18-hole championship golf courses. I was part of a media contingent on Tuesday that was the first to play the renovated Legends Course (formerly the South Course). You might recall the South from its days of hosting the PGA Tour’s Accenture Match Play, which was last held at La Costa in 2000. I have now played both renovated 18s and will have more to say about them in future posts, but for now I just wanted to give you a little glimpse of the new look of the Legends Course. This is the par-4 5th, the last of the five par-4s the Legends Course opens with. No. 5 is a mid-length par-4 – 370 yards from the blues and 346 from the whites – that plays even shorter due to the downhill. It’s a bit of a breather after what’s actually a pretty tough stretch of opening holes, but, overall, it’s indicative of what you get on the Legends Course. You can see the reworked bunkers waiting near the landing area, and this is how bunkering tends to be at La Costa – more strategically placed than plentiful. There’s plenty of room left, but I pushed my tee shot right and flirted with a drainage ditch on the right side. Fortunately the healthy rough held me up 2 feet short. I had a pitch over a tree to what is the Legends Course’s best defense – small greens. This is one thing that really didn’t change much during the redesign. Whereas the greens on the Champions Course are pretty sizeable, the Legends Course greens remain quite small by modern standards but true to the original design from 1969. Let’s just say you earn every GIR on the Legends Course. Unfortunately, my approach hit the bank next to the green and bounded off into the bunker. I ended up making an unsatisfying five given that I was within 50 yards off the tee. There are certainly tougher holes – although this is the No. 5 handicap, which surprised me – on the Legends Course but this one is undoubtedly pleasing to the eye. The originally routing on the Legends Course remains intact, but the greens on Nos. 1, 12 and 15 were slightly relocated during the renovation and the 17 green was moved most significantly, closer to the water. That doesn’t me mean much to those of us, like me, who barely knew the old course (I only played it once) but members are certain to appreciate the changes, which actually made the course play a little shorter. It’s now 6,587 from the blue tees and almost 7,000 from the tips. No. 15, a dandy dogleg left par-4 with a carry over a creek on the second shot, starts what the pros used to call “The Longest Mile in Golf,” named for the lengthy finishing holes, often played into a stiff ocean breeze, that stood between them and the finish. I can tell you the wind was dead into us on Tuesday and it wasn’t pretty on the scorecards. 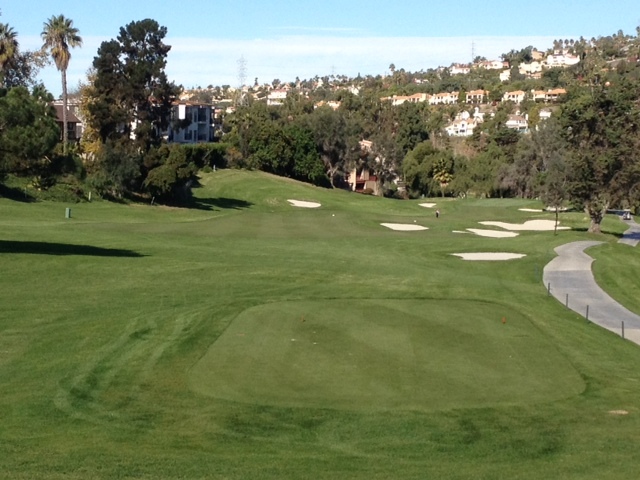 While La Costa is a private club, it is open to public play. My understanding is that daily play for members and guests will rotate between the two courses with the members having sole access to one course each day. If you’ve played the South Course (Legends) in the past, you may find one thing disappointing when you return. The signage that used to commemorate famous shots from the pros – such as Phil Mickelson driving the green on 15 (really????) and Tiger Woods being the first player to reach the par-5 17 in two – are gone. It’s a shame that history won’t be marked going forward, but I guess the reasoning is that it isn’t the same course, which, in the case of No. 17, for instance, is certainly true. Still, the Legends is a serious test of golf and La Costa, especially with its glorious Christmas tree, sparkles as a venue and gives you that feel of being in one of golf’s special places. If you play the renovated courses and read this, feel free to post your comments on the new-look La Costa as there are certainly many who are more familiar with the courses than I and can give a more informed take. For more extensive details about the renovation, you can go to www.lacosta.com. 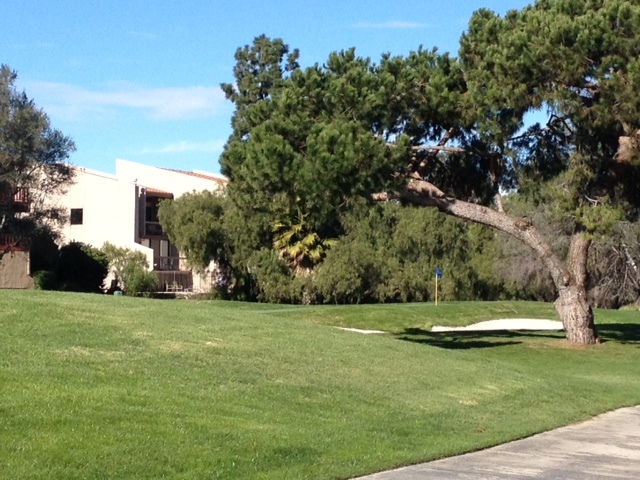 This entry was tagged Accenture Match Play, Carlsbad, La Costa Resort and Spa, Legends Course, renovation. Bookmark the permalink.